See also the U.S. Government Manual: Department of the Navy. 2A1. General. Any group of persons engaged in systematized and coordinated efforts direct to the attainment of a common objective may be called an organization. The institution and maintenance of any organized effort require direction. In the business world, this direction in termed management, while in affairs of government it is called administration. However, the work administration is not applied by the Navy or the Army to the conduct of stratetgical and tactical operations, or logistic activities. The direction of such operations is said to be a function of command. Difference between administration and command. The direction of a highly complex organization, such as the Navy, involves the administrative management of activitites whic contribute to the fulfillment of the mission of the navqal service, but do not constitute part of the combat activitiets of the service. Certain of these activities, such as those of the Bureau of Supplies and Accounts and the Bureau of Medicine and Surgery, are highly specialized and require distinct corps of officer specialist for their direction. On the other hand, many of the administrative activities of the service are conducted by officers who are trained to exercise tactical command or by officers who are actually exercising such command. Thus, it can be seen that there is a broad conception of command which includes administrative direction, such as the specialized direction of a naval hospital by the medical officer commanding it, or more general direction such as that exercised in an administrative unit of the fleet or the shore establishment. Command in the strict sense, however, consists of the direction of the combat activities of the naval forces, of specific training for combat, and of operations which are directly related to these activities. On the basis of this latter conception of the command function, the Navy and also the Army have integrated echelons of command which insure that combat operation shall be given precedence over administrative tasks or functions, and which also insure the precise coordination essential to unity of effort in naval and military operations. 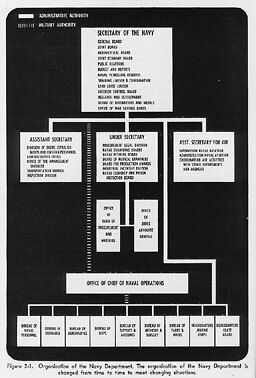 The organization of command on this basis in both the Navy and the Army provides for: (1) unbroken lines of military authority; (2) succession to command; (3) the exclusion of specialist officers form the exercise of military authority, except within their own organizations; and (4) the undivided authority, which coupled with commensurate responsibility, is essential to the prompt decision and positive execution necessary in the conduct of operations against an enemy. 2A2. Naval and military staffs. The word staff is used in the Navy in two ways. First, it is used to distinguish officers of the specialist corps, such as supply officers, medical officers, civil engineers, and chaplains, form the officers of the line of the Navy. Second, it is used to describe those groups of officers who assist and advise an officer in military command in the planning and execution of tasks. An example of such a group is the staff of the Commander-in-Chief, United States Fleet, who is also Chief of Naval Operations. A staff, as used in the second sense, constitutes an essential part of the command organization in a naval or military service. It is a means by which the function of command can be subdivided into component functions such as planning, execution of operations, training, communications, intelligence, and logistics, without sacrifice of authority or responsibility by the officer in command. The officers of a staff issue orders or other directives, but these must be issued as by direction of the officer in command in accordance with the policy of the superior in command. There are certain exception to the foregoing rule. A chief of staff, whose duty is to coordinate the work of a staff is in a logical position also to command. Thus, the Chief of Staff of the Army actually directs the military affairs of the Army. Similarly, the Vice-Chief of Naval Operations, who is a member of the staff of the Commander-in-Chief, United States Fleet, and Chief of Naval Operations, actually directs the logistic agencies which support the forces afloat, with, however, the difference that his direction is in accordance with the policy of his military superior. This is the only instance, however, in which the Navy departs from the usual practice of separating command and staff functions. 2A3. Directives. Direction in whatever form it may take is made known or expressed by directives, either written or verbal. A familiar form is the verbal command or order. But there are many kinds of directives expressing one or more phases of directive activity. A comprehensive directive, such as a campaign or operation order, may include a statement of objective, assignment of tasks, pertinent information derived form a survey of conditions to be encountered, instructions for the coordination of tasks, and necessary implementing orders. A directive for the purpose of administrative organization may state only general aims and assignment of functions. An example of a simple directive is a verbal command, or a decision on a question posed by a subordinate in the course of routine administration. Directives may be formal or informal. Examples of formal directives are the Constitution of the United States, Navy Regulations, and the Bureau manuals which extend Navy Regulations, formal legal decisions, war plans, campaign orders, and operations orders. Informal directives comprise verbal commands, orders, instructions, and routine decisions. Directives may be administrative or command directives. 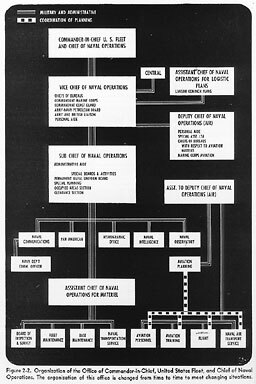 The Navy Regulations are an example of the former; an Operation Order is an example of the latter. 2B1. General. The President of the United States is the Commander-in-Chief of the entire naval establishment, and administers this organization through the Secretary of the Navy, who is a member of his cabinet. The naval establishment comprises: (1) a central directing and coordinating agency, the Navy Department; (2) the fighting forces termed by Navy Regulations, the naval forces, and (3) the naval districts, naval bases, navy yards, and naval stations which constitute the shore establishments. 2B2. The Navy Department. The Secretary of the Navy is charged with the general superintendence of the naval establishment. In practice, military authority, that is, the authority to direct the operations of the fighting force afloat and to provide logistic support for these operations, is exercised by the officer holding the combined offices of Commander-in-Chief, United States Fleet, and Chief of Naval Operations, while the administrative affairs of the naval establishment are directed by the Secretary of the Navy with the assistance of a civilian Under Secretary and two civilian Assistant Secretaries. The Under Secretary is assisted by the Chief of Procurement and Material and the Judge Advocate General. Commander-in-Chief, United States Fleet. An executive order of the President of the United States of 12 March 1942 provides that the duties of Commander-in-Chief, United States Fleet, and Chief of Naval Operations may be combined. Pursuant to this authority, General Order No. 170 issued by the Secretary of the Navy, staged that the duties have been combined and placed under one officer having the title Commander-in-Chief, United States Fleet, and Chief of Naval Operations. 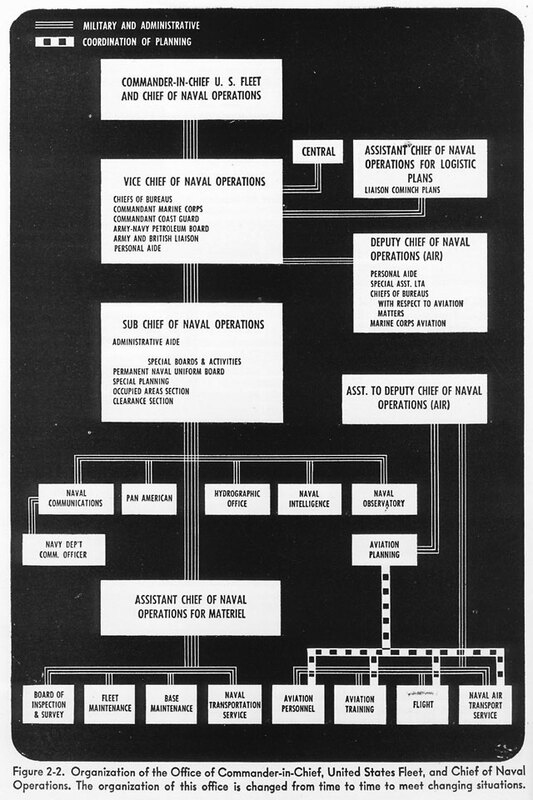 This reorganization, viewed in its correct perspective, creates on office with two distinct but correlated sets of duties: (1) the supreme command of the operating forces comprising the several fleets, seagoing forces, and sea frontier forces of the Navy; and 92) the preparation, readiness, and logistic support of the operating forces. The special circumstances of the current war have greatly increased and enhanced the importance of the duties performed by the Commander-in-Chief, United States Fleet, and Chief of Naval Operations. He has been designated as a member of the Combined Chiefs of Staff of the United States and Great Britain, which is charged with the broad planning of joint strategic action by the two nations. He also serves as a member of the Joint Chiefs of Staff, consisting of himself, the Chief of Staff to the President, the Chief of Staff of the Army, and the Chief of the Army Air Forces, which plans and issues the directives for joint action by the Army and Navy in carrying out operation sin which such joint action in necessary. Figure 2-1. 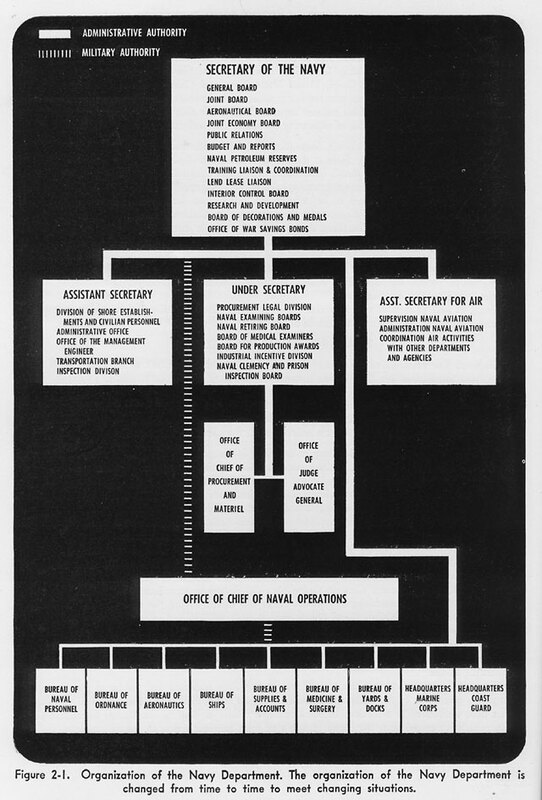 Organization of the Navy Department. The organization of the Navy Department is changed from time to time to meet changing situations. The directives so issued by the Joint Chiefs of Staff state the specific tasks to be accomplished by the Navy. The Commander-in-Chief, United States Fleet, and Chief of Naval Operations is charged with the responsibility for the planning and execution of the operations required of the naval forces in the accomplishment of these tasks. He is assisted in his work by his headquarters staff and the Vice-Chief of Naval Operations. 2B3. The Bureaus of the Navy Department. The bureaus, which are under the military authority of the Vice-Chief of Naval Operations are not grouped officially according to the functions they perform. However, three of the bureaus, Ships, Ordnance, and Yards and Docks, are commonly referred to as the material bureaus; three, Naval Personnel, Medicine and Surgery, and Supplies and Accounts, render specialized services to the naval establishment as a whole; the Bureau of Aeronautics, the Headquarters of the Marine Corps, and the Headquarters of the Coast Guard are organized to provide for special activities within the service. It is convenient, therefore, to list them in accordance with such a classification of related functions. Bureau organization. Each of the seven bureaus is headed by a Chief of Bureau and an Assistant Chief of Bureau. When the office of Chief of Bureau is filled by an officer below the rank of rear admiral, the officer holds the rank of rear admiral while holding the office. Chiefs of Bureaus may hold rank higher than rear admiral. In accordance with Navy Department practice, the bureaus are organized in divisions and sections which perform special functions. 2B4. The Bureau of Ships (BuShips). This bureau is charged with and responsible for the design, construction, and maintenance of the ships and small craft of the Navy. This responsibility includes the design, construction, installation, and maintenance of the main propelling machinery, auxiliary machinery, including that necessary for the distribution of electric power, and the exterior and interior communication systems; the design, development, and procurement of diving gear, paravanes, minesweeping gear, material and appliances for defense against chemical warfare, and for protection against fire. It is also responsible for the design and manufacture of all radio and sound equipage used ashore and afloat, including aircraft radio sets and all appliances used by the Naval Communication Service. It is furthermore responsible for the methods and equipment used in submarine rescue work. In carrying out these duties, the bureau utilizes its own facilities, those of the industrial activities of the naval shore establishment, and those of civilian industrial organizations. Experimental laboratories, such as the Naval Research Laboratory, the David W. Taylor Model Basin, the Naval Engineering Experiment Station, and several others are maintained by the bureau. The navy yards undertake construction and repair and some manufacture. Civilian manufacturing companies supply machinery and equipage, and civilian shipbuilding concerns undertake the construction of vessels. The bureau deals with navy yards through the industrial managers of the yards. It has its own field forces, the supervisors of shipbuilding and inspectors of naval machinery, who supervise construction in civilian establishments, and it maintains jointly with the Bureau of Ordnance and the Bureau of Aeronautics the offices of the inspectors of naval material. 2B5. The Bureau of Ordnance (BuOrd). The Bureau of Ordnance provides the operating forces of the Navy with (1) guns and mounts; (2) armor, projectiles, and bombs; (3) fire control and optical equipment; (4) underwater ordnance, such as torpedoes, mines, depth charges, nets and booms; and (5) small arms and ammunition. The bureau avails itself of civilian production facilities, but also has its own plants for the production of ordnance materials. Naval ordnance establishments include gun factories, ordnance plants, powder factories, proving grounds, ammunition depots, torpedo stations, mine depots, and magazines on shore. 2B6. The Bureau of Yards and Dock (BuDocks). The Bureau of Yards and Docks was, until the present war, an activity serving the fighting forces only in an indirect way by designing, constructing, and maintaining the public works and public utilities of the shore establishments. In addition to executing these primary tasks, the bureau is now rendering a very valuable direct service in the development of advance bases of the operating forces. It also has assisted in the formation of the Seabees, or Construction Battalions, which undertake the construction in these outlying activities. 2B7. The Bureau of Naval Personnel (BuPers). The Bureau of Naval Personnel procures, trains, and distributes the officers and enlisted personnel of the Navy, and provides for their education and welfare. It is also charged with responsibility for the maintenance of discipline in the service. Figure 2.2. Organization of the Office of Commander-in-Chief, United States Fleet, and Chief of Naval Operations. The organization of this office is changed form time to time to meet changing situations. A most important task incidental to these duties is the keeping of service records of enlisted personnel and reports on performance for every officer and enlisted man in the service. It has several principal subordinate offices, each headed by a director. These include: (1) officer personnel, (2) enlisted personnel, (3) planning and control, (4) training, (5) welfare, and (6) services. There are also two independent divisions, the Chaplains' Division, and the Women's Reserve (WAVES) Division. Other activities directed by the bureau are the Naval Academy, the Post-Graduate School, the Naval War College, the Naval Home, training stations and special schools for enlisted men, naval units in universities and colleges, and special schools for the training of reserve officers. 2B8. The Bureau of Medicine and Surgery (BuMed). The specific responsibility of the Bureau of Medicine and Surgery is the maintenance of the health of the Navy, the care of its sick and injured, and the professional education and training of the officers, nurses, and men of the medical department. The bureau maintains health records of all officers and enlisted men of the Navy. The Bureau of Medicine and Surgery provides for the physical examination of officers, nurses, and enlisted men with a view to the selection or retention of only those whose physical condition is such as to maintain or improve the military efficiency of the service. The Bureau of Medicine and Surgery is charged with the management and control of all naval hospitals; naval dispensaries located at all naval stations; medical supply depots; issuing storehouses in all naval districts; naval mobile base hospitals; medical laboratories; the National Naval Medical Center; and of all technical schools established for the education or training of members of the Medical Corps, Dental Corps, Nurse Corps, and Hospital Corps. 2B9. The Bureau of Supplies and Accounts (BuSandA). The Bureau of Supplies and Accounts is charged with the procurement, purchase, receipt, custody, warehousing, issue, and shipment of all supplies, fuel, and other materials for the Navy, except supplies for the Marine Corps, and except for procurement of certain special items of ordnance material and the storage and issue of medical stores, ammunition, projectiles, mines, and explosives. It recommends the details to duty of officers of the Supply Corps. It exercises administrative supervision over fuel plants, commissary activities, supply depots, and storehouse at navy yards and stations. It conducts sales for the disposal of condemned, salvaged, and scrap materials, and condemned vessels. It prepares and submits estimates of the funds required for freight, fuel, clothing, pay, allowances, subsistence, and transportation of Navy personnel. It recommends the necessity for, and the location, type, size and interior arrangements of, supply spaces afloat. It does the same for storehouses ashore. It has charge of the procurement and disbursement of funds for the payment of military and civilian pay rolls, and for all articles and services procured for the Navy as well as the keeping of all money and property accounts. 2B10. The Bureau of Aeronautics (BuAer). With regard to function, the Bureau of Aeronautics occupies a position between the six bureaus which render a special service to the operating force as a whole, and the relatively independent Headquarters of the Marine Corps and the Coast Guard. This bureau provides the Navy and the Marine Corps with airplanes, and has the responsibility for maintaining them in service. It conducts the flight and ground training of all aviation personnel except those in the fleets. In practice, it controls the distribution of aviation personnel, although the Bureau of Naval Personnel is responsible for the procurement of aviation personnel and issues orders for their distribution. This bureau is charged with the upkeep and operation of all aeronautic shore establishments of the Navy and Marine Corps, with the exception of the military operations of aircraft from naval air stations. 2B11. The Headquarters, United States Marine Corps. The most recent statement of United States naval policy states as one of the general policies of the Navy, the maintenance of the Marine Corps in such strength as to provide the requisite Fleet Marine Force and detachments for other naval purposes. The Fleet Marine Force, although based ashore, is an integral part of the United States Fleet under the direction of the Commander-in-Chief, United States Fleet. It is maintained as a mobile force in immediate readiness for use in operations undertaken for the seizure and defense of advanced bases. The force is composed of infantry, artillery, aviation, tank units, signal, engineering, and chemical troops. Separate Marine detachments are provided as part of the crews of battleships, cruisers, and aircraft carriers, for guard duty in the Navy Department and in the shore establishments. The Marine Corps is under the administrative command of the Commandant of the Marine Corps, who is responsible for the procurement, training, discipline, and distribution of officers and enlisted personnel, and for the supervision of all administrative activities of the Marine Corps. The Headquarters of the Marine Corps is organized as the office of the Commandant and three staff departments. In the office of the Commandant are the Assistant to the Commandant, who acts as Chief of Staff, and several directors of divisions with specialized functions such as Plans and Policies, Personnel, and Aviation. The staff agencies are: (1) The Adjutant and Inspector who has supervision of legal matters, records, and inspections; (2) The Paymaster who has supervision of matters relating to pay and allowances of the Marine Corps; and (3) The Quartermaster who has supervision of the purchase of and payment for military supplies. 2B12. The Headquarters, United States Coast Guard. The United States Coast Guard operates in time of peace under the direction of the Secretary of the Treasury as a Federal maritime policy agency in the prevention, detection, and suppression of violations of the maritime laws, the saving and protection of life and property at sea and in the coastal waters of the United States, and the promotion of the safety and security of vessels using our waters for legitimate commerce and pleasure. In time of war, the Coast Guard operates as part of the Navy. Its armed fleet of large cruising cutters forms part of the sea frontier forces engaged in patrol and in the protection of convoys, and thus operates under the direction of the naval forces afloat. Its most important wartime activities, however, are conducted under the direction of the commandants of the naval districts, and are activities, which by reason of its peacetime duties, it is particularly well-fitted to perform. For example, the Coast Guard Captain of the Port organization provides safeguards against the destruction or injury of vessels, harbors, ports, and waterfront facilities by sabotage. It also supervises the movement of merchant vessels in port, and watches over vessels loading explosives and other dangerous cargoes. In addition, the Coast Guard port organization provides a specially trained fireboat service for the protection of piers in the large harbors of the United States. The administrative affairs of the Coast Guard are directed by the Commandant of the Coast Guard, an officer of the rank of vice admiral, who maintains his office in the Coast Guard Headquarters in Washington. The Headquarters is simply and efficiently organized on a functional basis. In addition to the offices of the Commandant and Assistant Commandant, which constitute the over-all directing activities, it has six divisions: Personnel, Material, Operations, Inspection, Finance, and Legal. 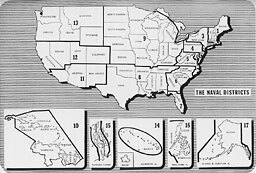 For the purpose of administration, the United States and its territories and possessions are divided into 16 Coast Guard districts. At the present time, each of these districts operates under a district Coast Guard officer, under the supervision of the commandants of the various naval districts. 2B13. Other divisions. Naval Communications. This division furnishes the naval establishment with the communication facilities necessary for the efficient direction and coordination of naval activities. It is responsible for the organization and administration of the radiotelegraph, radiotelephone, telegraph, telephone and cable systems of communication within the naval service, and for the operational procedures used in these systems and in the visual systems of communication used by the operating forces. It also operates the naval postal system and prescribes the procedures and forms for handling guard mail within the operating activities. The division is also an operating agency. its communications office providing a center for the communication channels which connect the Navy Department and Commander-in-Chief, United States Fleet, and Chief of Naval Operations with the forces afloat and the activities of the shore establishment. Another and most important duty of the division is the provision of instructions covering the security of communications which are secret or confidential in nature. Naval Intelligence. This division is responsible for the collection and classification of information of military value for the naval establishment. It disseminates such information to naval and military officers and other governmental officials as necessary. One section of this activity specializes in foreign intelligence in general; an interesting example of this function was the collection of information by our consular agents in North Africa prior to the landing. Another section specializes in combat intelligence, that is, information relating to enemy activities. The third section specializes in domestic intelligence for the purpose of discovering and preventing subversive activities. This division supervises the activities of all naval attachés and naval observers abroad, and is the official channel of communications for all foreign naval attachés to the United States. The Hydrographic Office. This organization is responsible for the making of hydrographic surveys in foreign waters and on the high seas; research in oceanography; the collection of hydrographic and navigational material; the preparing and printing of charts including confidential, strategical and tactical charts; the preparation and issue of navigational and sailing directions, and light lists for specific localities. 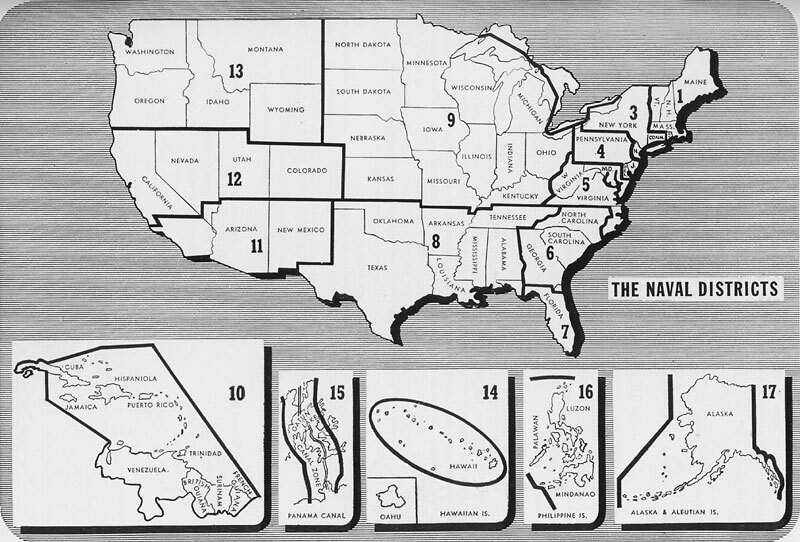 Except for material which is restricted to use by the Navy and Army, the information, charts, and publications of the Hydrographic Office are available for distribution to the public. The Naval Observatory. This division publishes data compiled from continuous and exhaustive astronomical observations, in the American Ephemeris and its supplements, the nautical Almanac and the Air Almanac which are used by navigators and scientists. Its observations enable it to set and broadcast the standard time for the country. The observatory also develops, supplies, and repairs designated navigational, aeronautical, and aerological instruments for the ships and aircraft of the Navy. 2B14. The Naval Reserve. The purpose of the Naval Reserve is to provide a force of qualified officers and enlisted men who are available for immediate mobilization in the event of a national emergency and who, together with the active and retired personnel of the regular Navy, can effectively meet the needs of the expanding naval establishment while an adequate flow of newly trained personnel is being established. Composition. The Naval Reserve is considered a part of the United States Navy and consists of the following: (1) the Fleet Reserve, (2) the Organized Reserve, (3) the Volunteer Reserve, (4) the Merchant Marine Reserve, and (5) the Women's Reserve. Naval Reserve Midshipmen's Schools. This program of voluntary training was announced on 26 June 1940 by the President of the United States. At present, Naval Reserve Midshipmen are required to have a college degree, or the equivalent in practical experience, or to have successfully completed the Navy V-12 college curriculum. Applicants must be between the ages of 19 and 27, and must meet the same rigid physical requirements as midshipmen at the Naval Academy. The candidates are enlisted as apprentice seamen in the Naval Reserve of the United States in a class designated V-7. U.S.N.R. Midshipmen's School Columbia University, New York, N.Y.
U.S.N.R. Midshipmen's School Abbott Hall, Northwestern University, Chicago, Ill.
U.S.N.R. Midshipmen's School University of Notre Dame, Notre Dame, Ind. U.S.N.R. Midshipmen's School U.S. Naval Academy, Annapolis, Md. U.S.N.R. Midshipmen's School Cornell University, Ithaca, N.Y. The school at the Naval Academy has been training Naval Reserve Midshipmen of the engineering branch. Some engineering students also are trained at the school at New York, N.Y. Upon the successful completion of an indoctrination period, consisting of from 3 to 4 weeks, candidates are sworn in as Naval Reserve Midshipmen. Immediately they begin a 3-month course of intensive study. In deck schools, five subjects are given: navigation, seamanship, communications, ordnance, and damage control. (Recently a course in recognition of ships and aircraft has been added.) Aspirants to engineer officer commissions take courses in electrical engineering, boilers and auxiliaries, construction and main engines, and naval administration. In addition, all midshipmen participate in frequent physical drills, gun drills, and seamanship drills. At the end of this 4-month period of training, the candidate is commissioned as ensign in the United States Naval Reserve, providing that he has been successful in meeting all the requirements. The newly commissioned ensigns are then ordered to active duty. The effectiveness of a graduate of a Naval reserve Midshipmen's School in his new billet depends largely upon his native intelligence and his willingness to work. 2C1. General. The shore establishments include all naval shore activities except the Navy Department and certain specific activities such as fleet air bases, outlying bases, and advanced bases which are directed by the forces afloat. into 16 naval districts and two river commands, each under a commandant who is usually of the rank of rear admiral. The districts are listed as follows. First New England, less Connecticut Boston, Mass. Third New York, Connecticut, and upper New Jersey New York, N.Y.
Fourth Pennsylvania, lower New Jersey, and Delaware Philadelphia, Pa.
Fifth Maryland, Virginia, West Virginia, and north coastal region of North Carolina Naval Operating Base, Hampton Roads, Va.
Potomac River Naval Command The Potomac River Area, including the District of Columbia, and certain bordering counties in Maryland and Virginia Navy Yard, Washington, D.C.
Severn River Naval Command Anne Arundel County, Maryland United States Naval Academy, Annapolis, Md. Sixth North Carolina (except north coast), South Carolina, Georgia Charleston, S.C. Seventh Florida, except portion of northern Florida lying west of the Apalachicola River Miami, Fla. Eight South Central States New Orleans, La. Ninth North Central States Great Lakes, Ill.
Eleventh Southern third of California, Arizona, and New Mexico San Diego, Calif.
Twelfth Northern two-thirds of California, Nevada, Utah, and Colorado San Francisco, Calif.
Thirteenth Washington, Oregon, Idaho, Montana, Wyoming Seattle, Wash.
Fourteenth Hawaiian Islands-Midway Area Pearl Harbor, T.H. Fifteenth Panama Canal Zone Balboa, C.Z. Sixteenth Philippine Islands Cavite, P.I. The Vice-Chief of Naval Operations is charged with the responsibility for the exercise of military authority over the shore establishments. This task includes such matters as defense of the harbors and inland waterways in cooperation with the Army, the internal security of shore stations and plants, the protection of harbor works and shipping against sabotage, and the maintenance of beach patrols. It also involves the direction of naval communication facilities on shore in various parts of the country, and the domestic intelligence activities of the Navy, and in addition it requires contact with forces afloat so that the operations of these forces may be facilitated. Further, it involves such operations as the preparation and routing of convoys, and the regulation and control of harbor traffic as necessary in time of war. Obviously these matters cannot be handled from Washington. It is necessary to decentralize the exercise of military authority by the creation of the naval districts, each with a commandant who is a direct subordinate of the Vice-Chief of Naval Operations. 2C3. Operating bases. The major operating bases are located in harbors and bays where there are large protected fleet anchorages, such as, for example, Hampton Roads on the East Coast, and San Francisco Bay on the West Coast. The function of these bases is to furnish the vessels of the fleets with needed services. They have receiving stations for the transfer of personnel to and from the vessels afloat; supply depots for the supply of equipage and stores; medical storehouses; oil storage tanks for the supply of fuel; and district craft such as tugs, lighters, and fueling barges to service the vessels at anchor. In addition to these facilities, other activities such as training stations, air stations, and hospitals may be located on the bases. These major operating bases do not provide repair facilities for larger ships, though in some cases navy yards are physically located within their limits. Smaller operating bases for the servicing and repair of the smaller craft of the sea frontier forces and the inshore patrol are located along both coasts and in the outlying districts. 2C4. Navy yards. There are 11 navy yards, the main function of which is to build and repair all types of naval vessels. Besides this essential activity, various products necessary to maintain the forces afloat are manufactured at the navy yards. The principal navy yards are located as follows: (1) Navy Yard, Puget Sound (Bremerton), Wash., main repair yard for large ships on Pacific Coast, also construction; (2) Navy Yard, Mare Island, Calif., repair yard for other than large ships, also construction; (3) Navy Yard, New York, N.Y., repair and construction yard; and (4) Norfolk Navy Yard, Portsmouth, Va., repair and construction yard. 2D1. General. The circumstances of the present war have brought marked changes in the conception held concerning the employment of naval forces in war. The use of land-based aircraft operating over the sea has been a tremendous factor in bringing about these changes. Control of the sea is no longer assured b y destroying an enemy fleet or containing it within its harbors; present indications are that it cannot be exercised in those areas where the enemy possesses a decisive superiority in aircraft. One striking development of this new type of naval warfare is the use of amphibious expeditions to capture adequate bases from which aircraft can be operated. Another is the increase in number of joint undertakings by the Army and Navy. These joint undertakings have led to new conceptions of higher command. Naval officers may command not only naval forces, but land, sea, and air forces in certain areas where sea activities predominate. In other areas (for example, the Southwest Pacific where joint undertakings are necessary but the land activities predominate) naval forces may be under the command of an Army officer. As a consequence, higher naval commands tend to be area commands rather than fleet commands in the old sense. The use of naval task forces, in which the composition of the forces is adapted to the task at hand, has been another striking feature of this war. A fleet has now come to mean the forces within a sea area instead of a force of fixed size and composition which proceeds as a unit from place to place. This task force system is one of great flexibility and does not preclude the use of the entire forces in an ocean, or even the entire U.S. Fleet as a task force. Though these changes may be due in large measure to the particular conditions of the present war, there can be little doubt that they will greatly influence the organization and operations of the naval forces in the future. The naval forces of the United States consist of the seagoing forces, sea frontier forces, naval local defense forces, and naval district craft. The designation given for the fleet groups are those actually used in fleet organization. The term force is no longer applied to battleship, cruiser or destroyer groups. For example, the battleships assigned to the Pacific Fleet are designated as Battleships, Pacific Fleet. An air force is composed of carrier forces, carrier aircraft squadrons, seaplane tenders, and patrol wings. An amphibious force is made up of divisions of transports, and flotillas of landing ships and landing craft. A service force is made up of vessels which service the fleet, such as repair ships, supply ships, oilers, and hospital ships. It also has been found practical to include the mine forces as part of the service forces. Each sea frontier is commanded by a flag officer who may or may not also be the commandant of a naval district. All sea frontier commanders are direct subordinates of the Command-in-Chief, United States Fleet, and Chief of Naval Operations. 2D4. Naval local defense forces. These forces consist of small patrol craft, small minelayers, and minesweepers, which operate inshore in naval districts, and in outlying bases. Those in the districts are under the command of the district commandants; those in outlying bases are under the command of the forces afloat. 2D5. Naval district craft. These consist of miscellaneous small craft manned by naval personnel and used in the districts. 2D6. Organization of the naval forces into fleets. The United States Fleet consist of all the seagoing forces of the Navy with the exception of the vessels of the Naval Transportation Service and special duty ships. It is commanded by the Commander-in-Chief, United States Fleet, and Chief of Naval Operations, who includes within the scope of his command the Fleet Marine Forces and the naval advanced base activities. COMINCH, as he is called, maintains his headquarters in the Navy Department. The commands of these fleets are area commands. The fleets are not permanently organized as to size and composition, nor is the individual fleet free to move in any area as a fleet. Instead, the fleets consist of such forces as may be assigned to the naval commanders in each principal area, and they vary in size and composition as component forces are shifted from one area to another. Naval Commander in that theater; (2) the Commander-in-Chief, Atlantic Fleet, who has general command of all operations of the United States naval forces in the Atlantic, except for those which may be directly controlled by COMINCH. 2D7. Task forces. A naval task force is as the name implies, a force specially organized for the accomplishment of a specific task. As the task may vary, so does the task force. It may consist of a force of a type or it may be an organization of forces of two or more types. Operations are now conducted by task forces instead of fleets. Such task forces are formed as task forces of a particular fleet and may be composed of part of all of the forces of that fleet. They may also include reinforcements from the fleets of other areas. Thus, if a certain specific campaign is contemplated in the South Pacific, the Commander-in-Chief, Pacific Fleet, may detach forces from his own fleet and send them to the South Pacific to operate as part of a task force of the South Pacific Command. Or should all available forces in the Pacific be desired for a campaign in the main Pacific Area, they would be assembled as a task force of the Pacific Fleet. Organization into fleets and task forces makes coordination of naval operations with those of the army possible in combined operations. 2D8. Type Organization. A type organization is a subdivision of a fleet or force, comprising all vessels of the same type attached to such fleet or force, together with such flagships, tenders and aircraft as may be assigned. Type organizations are further subdivided as follows: (1) battleships, cruisers, and aircraft carriers into division; 92) destroyers and submarines into squadrons and divisions; (3) aircraft into wings, groups, squadrons, and divisions or sections; (4) the transports of an amphibious force into divisions; and (5) the landing craft of an amphibious force into flotillas and divisions. 2E1. Introduction In our previous discussion of the naval organization, the offices and bureau of the Navy were considered individually. It should be pointed out, however, that no bureau carries out its duties independently. The Navy Department is built upon a highly developed chain of command and a logical division of labor. When an order issued from the top of this chain of command, it comes down step by step. The various activities that are involved are divided and distributed at several different levels so that they finally descend to the divisions which are most properly suited for executing them. The high degree of coordination existing between the bureaus insures that an order is carried out with unity in spite of the fact that it is being executed in many different places. In this section, let us take a specific example which will illustrate how one order can create activity for nearly every part of the Navy Department. Let it be assumed that a new aircraft carrier is needed. By following this ship from inception to completion, it will be possible to show that it calls for the efforts of many specialized workers. 2E2. Authorization of a ship. To begin with, the Chief of Naval Operations makes a request for a new aircraft carrier. The request goes to the General Board. This small group of well-informed and widely experienced officers is constantly aware of what ships the Navy possesses and is well-fitted to judge what ships the Navy will need in the near future. The General Board is thoroughly acquainted with the specifications of previously constructed carriers and knows how they have performed in action. It is likewise informed concerning the advances that have occurred in naval architecture since the previous ships were designed. With this information and with the advice of any bureau upon which it wishes to call, the General Board very carefully establishes the specifications of the new aircraft carrier, indicating the most favorable compromise of size, armor, ordnance, speed, and other essential characteristics. The General Board submits to the Secretary of the Navy a recommendation that a ship embodying these specifications be built. If the Secretary of the Navy approves the recommendation, it is submitted to the President. If the President approves it, it must still be submitted to Congress in order that an appropriation can be made to cover the cost of the ship. When the funds have been appropriated by Congress, work begins in many quarters. The following discussion shows how the orders issued by the Secretary of the Navy pass down through several levels of authority and are divided and subdivided several times before they reach the ultimate divisions that perform the specialized parts of the work. The arrangement does not indicate the chronological order of activity except within the individual bureaus. It must be assumed that all the bureaus are performing their tasks simultaneously so that the ship will be completed on or before a certain date. As the order for the construction of a new carrier is issued by the Secretary of the Navy, the first division of labor occurs in a three-way split among the Under Secretary of the Navy, the Assistant Secretary of the Navy, and the Assistant Secretary of the Navy for Air. 2E3. Office of the Under Secretary of the Navy. The Under Secretary of the Navy is responsible for all procurement related to the building of the new ship. He is responsible for the negotiation of contracts with private firms for services and materials. These contracts may vary in size form a contract for the construction of a complete ship in a private shipyard down to the purchase of a minor bit of equipment. In this huge task, the Under Secretary is assisted by the Chief of Procurement and material.? This officer, as representative of the Under Secretary, coordinates the entire procurement program of the Navy Department, and all purchases pertaining to construction of the new aircraft carrier theoretically come under his scrutiny. The Office of Procurement and Material is primarily responsible for allocating material and manpower to Navy contractors, and supervises the establishment of prices for the materials and equipment going into the ship. The Under Secretary is also assisted by the Office of the Judge Advocate General. This office begins its work in connection with the new aircraft carrier by consulting with the interested bureaus and drafting the appropriation bill which is submitted to Congress. The drafting of the contracts id done by the Procurement Legal Division in conjunction with the Contract Divisions of the several bureaus and the Price-negotiation section of the Office of Procurement and Material. The Procurement Legal Division has offices in each bureau which prepare and approve all contracts prior to execution by the bureau contracting officers to whom the Under Secretary has delegated the authority to execute contracts. In addition, the Procurement Legal Division has a central office which handles general legal problems affecting all Navy Procurement. The Incentive Division of the Office of the Under Secretary will operate throughout the construction of the ship by stimulating production of all materials that go into the ship. 2E4. Office of the Assistant Secretary of the Navy. The Assistant Secretary of the Navy is closely associated with the construction of the new carrier. If the ship is constructed in a navy yard, he will be in charge of all civilian personnel working upon her. In his control over shore establishments, he has charge of all facilities at navy yards and other Navy-operated establishments, which may build the vessel or a substantial part of the equipment for her. It is through the Assistant Secretary that ordnance stations and other facilities work to provide guns, ammunition, and other important supplies and equipment. The Assistant Secretary also has charge of all labor problems that may arise in connection with building. 2E5. Office of the Assistant Secretary of the Navy for Air. Since the new vessel is to be an aircraft carrier, the Assistant Secretary of the Navy for Air is vitally interested in her. He probably will be called before the General Board to make recommendations concerning the design of the new ship. All during the long process of designing and constructing, he will be giving technical advice and assistance to the Bureau of Ships. Much of his work, of course, will be handled by the Bureau of Aeronautics, over which he has authority. The Assistant Secretary of the Navy for Air must include in his plans the fact that 80 to 100 planes will be required as the aircraft complement of the new vessel and the fact that sufficient pilots and mechanics must be provided to operate and maintain them. He must set in motion the machinery that will supply these needs. 2E6. Office of the Commander-in-Chief, United States Fleet, and Chief of Naval Operations. The need for a new aircraft carrier is first felt in this office. The need may have been recognized in the Fleet as a result of military action, or it may have been realized by the Planning Division. The request for the ship passes upward to the Chief of Naval Operations. If he approves the request, it is submitted to the General Board. The request includes certain structural specifications and a statement of the strategical uses for which the ship is needed. While the ship is being designed and constructed, the Chief of Naval Operations continue to make recommendations (which have the force of orders because he has military authority over all bureaus) for structural changes which will make the ship more effective in battle. These changes in construction may affect several bureaus, the principal ones being the Bureaus of Ships, Ordnance, Aeronautics, and Yards and Docks. When the ship is commissioned, she will become associated with several subdivisions of the Office of Commander-in-Chief, United States Fleet, and Chief of Naval Operations under the general supervision of the Assistant Chief of Naval Operations for Logistic Projects. 2E7. Bureau of Ships. The Bureau of Ships has a larger dollar volume of procurement than any other Bureau. Its far-flung activities are found throughout the world. Its main job is ship construction. Its work begins as soon as the new ship is contemplated by the General Board. The General Board calls upon the Bureau of Ships for preliminary designs. The Chief of the Bureau of Ships and the Assistant Chief of the Bureau pass the orders down to the Shipbuilding Division. That part of the Shipbuilding Division which works with the General Board and is concerned primarily with preliminary plans is the Preliminary Design Section. It prepares generalized plans of the hull, flight deck, superstructure, engine rooms, storage spaces, and so forth. The bureau is constantly studying and adopting the latest scientific developments for its ships. For purposes like this the David W. Taylor Model Basin in Carderock, Maryland, was built. Here, with miniature ships on a miniature ocean, new inventions, improvements, and tactics are tested before being used in actual conflict. Serving similar purposes and the Naval Research Laboratory, Naval Engineering Experiment Station, Naval Materials Testing Laboratories, Underwater Sound Laboratory, and the U.S. Naval Radio and Sound Laboratory. Laboratories for testing and developing paints, rubber products, rope and chain are set up at navy yards located throughout the United States. Models are given a thorough testing. The plans are then revised in accordance with these tests in order that the completed ship will give the most satisfactory performance. The Contract Design Section then prepares plans and specifications which are drawn in considerably greater detail. These plans are submitted to private builders for bids. When the plans and specifications have been completed by the Contract Design Section, bids have been received and evaluated, and decision relative to award has been made, the Counsel for the Bureau of Ships and the Contract Section of the Shipbuilding Division draw up the actual contracts. The final and most complete set of plans is drawn by the builder of the ship, which may be either a civilian concern or a navy yard. In either case, the work will be carefully supervised by officers of the Bureau of Ships. While the Shipbuilding Division is busy creating designs for the ship and keeping an eye on her construction, the Radio Division is at work designing, procuring, and installing radio, sound, and radar equipment. The Construction Branch of the Shipbuilding Division supervises all work under construction. It is directly responsible for meeting the scheduled date of the shipbuilding program. To accomplish this aim, it assists builders in obtaining priorities and eliminating bottlenecks so that production can proceed according to schedule. The Bureau of Ships retains cognizance over the ship after its actual construction. When it has satisfactorily completed its trials, the ship is transferred to the Maintenance Division whose responsibility it is to see that it is kept fit to fight. 2E8. Bureau of Naval Personnel. The Bureau of Naval Personnel supplies the enlisted and officer complement of the aircraft carrier. All staff corps officers and aviation officers are nominated by the cognizant bureaus and the Deputy Chief of Naval Operations for Air. The bureau must make plans so that when the ship is ready to be manned, over two thousand trained officers and enlisted men will be ready to go aboard. Orders proceed downward through the Chief of the Bureau and the Assistant Chief of the Bureau to three principal officers: the Director of Officer Personnel, the Director of Enlisted Personnel, and the Director of Training. The Director of Officer Personnel makes plans for the transfer from other ships or stations of a certain number of experienced officers who will occupy the key posts on the new carrier, bearing in mind that these officers must be replaced in their former posts. The remainder of the officers must be drawn from midshipmen's schools, officers' indoctrination schools, and so forth. So that these schools will have a sufficient number of graduates at the proper time, Offices of Naval Officer Procurement in the principal cities of the country will be instructed to receive applications for commissions. Doctors and aviators are procured through these same channels but they are supervised by personnel divisions in the respective bureaus after they are brought into the service. The Director of Enlisted Personnel has a similar task except that he deals with enlisted men. He arranges for a transfer of a certain number of experienced men from other ships and arranges to draw the remainder from naval training schools and stations. In order that the proper number of men will be ready at the right time, he must assign new men to the schools for this purpose. These men are recruited or they are provided by Selective Service. The Director of Training is in charge of the training program of both officer and enlisted men. Nearly all the skills and trades known to civilian life exist on a big ships, and the Navy must supply most of the training for these occupations. In addition, it must supply training in all skills pertaining to warfare. Midshipmen's schools, communication schools, ordnance schools, engineering schools, bakers' schools, and many other schools must be drawn upon so that the new carrier will have well-trained personnel. 2E9. Bureau of Ordnance. In the Bureau of Ordnance, the orders concerning the new aircraft carrier proceed down through the Chief and the Assistant Chief of the Bureau to the Production Division which is responsible for the manufacture, delivery, and installation of guns upon new vessels. Considerable coordination is required with the Bureau of Ships both in the designing and in the construction stages in order that the guns will be properly suited to the ship. The collaboration in designing also carriers over to ammunition storage spaces, shell hoists, gun mounts, fire control centers, and so forth. Ordinarily the guns aboard an aircraft carrier are of small caliber. Her chief ordnance problem is antiaircraft, and the Production Division of the Bureau of Ordnance must either manufacture these guns in naval gun factories or arrange for their purchase through the Chief of Procurement and Material. Guns and ammunition for the planes aboard the aircraft carrier must also be provided in the same way. Once the ordnance equipment on a new ship is complete, the Fleet Maintenance and Supply Division provides spare parts and keeps on hand replacements for use whenever they may be required. 2E10. Bureau of Aeronautics. The orders which come to the Bureau of Aeronautics concerning the new aircraft carrier indicate the number of planes that will be needed, the number of trained aviation personnel required, and so forth. They proceed from the Chief of the Bureau to the Assistant Chief. The Chief of the Bureau is advised by a Planning Division, which controls the programs for all aircraft. The Planning Division acts on the basis of data furnished by the Military Requirements Division. Both of these divisions work in close collaboration with the Bureau of Ships in the designing and construction of those parts of the ship that are devoted to aviation: flight decks, aircraft elevators, stowage spaces, repair facilities, and signaling positions. From the Assistant Chief of the Bureau of Aeronautics, orders pass down to several subordinate divisions. The Material Division designs planes and procures planes either by building them or by arranging for their purchase. It also arranges through the Chief of Procurement and Material or the Bureau of Supplies and Accounts for the purchase of all the supplies and materials which must necessarily be aboard the new carrier in order to carry on naval aviation. The Photographic Division supplies the cameras and materials necessary for their phase of military aviation. The Training Division of the Office of Deputy Chief of Naval Operations for Air prepares to train the hundreds of officers and enlisted men who will be assigned to the aviation division aboard the new carrier. As fast as they are provided by the Bureau of Naval Personnel through its personnel procurement program, the Training Division receives them and sends them to school until they are competent. The Personnel Division of the Office of Deputy Chief of Naval Operations for Air supervises the distribution of all officer personnel attached to the aeronautic organization. It will assign aviation officers to the new carrier. It likewise maintains a close liaison with the Bureau of Naval Personnel in the matter of distribution of enlisted men who are trained for aviation duty. Administrative Group, Logistics Planning Division. The Ship's Section of the Logistics Planning Division receives preliminary plans from the Bureau of Ships in the early stages of design. It reviews these plans, approving or recommending changes in the arrangement of spaces to be used by the supply and disbursing officers. This section also prepares a tentative ship's loading plan. Prior to commissioning of the new vessel and loading of her stores, the quantities to be prepared for loading are recommended by letter to the prospective Commanding Officer. Traveling field representatives of the Ship's Section assist and advise the prospective supply officer in all phases of outfitting. The Supply Group, which includes the Stock Division and the Aviation Supply Division, is responsible for furnishing supplies and stocks mentioned above. The Bureau's Purchase Division procures these stocks. The Finance Group disburses funds for the services, equipment, and material that go into the building and equipping of the new ship. Many disbursements, however, are made in the field under delegated responsibility. The Accounting Group maintains records of expenditures made under projects and the Audit Division of this group makes audits of these expenditure records. The Cost Inspection Service maintains cost inspectors in the plants of shipbuilders and other naval contractors maintaining a constantly up-to-date audit of allowable expenditures. The work of this service guarantees in great measure that the Navy is receiving full value for its money. 2E12. Bureau of Medicine and Surgery. In this bureau, orders relating to the new aircraft carrier pass from the Chief of Bureau down through the Assistant Chief of Bureau to several divisions. The personnel constituting the flight component of the ship's complement have normally qualified physically and professionally for duty involving the operation of aircraft, prior to their assignment to this type of duty. he Personnel Division must assign a suitable number of medical officers, dental officers, and hospital corpsmen to serve the medical needs of the ship. Some of the officer and enlisted personnel assigned to this type of ship are qualified by prior training in the field of aviation medicine. The Planning Division works with the Bureau of Ships in the designing of the space assigned to the Medical Corps so that it will be of sufficient size and convenience. The Administrative Division arranges for the issuing of medical supplies and equipment from its stocks to the new ship. If certain items are not in stock, they must be procured through the Purchase Division of the Bureau of Supplies and Accounts. 2E13. Bureau of Yards and Docks. The Bureau of Yards and Docks provides all shore facilities required for the construction and repair of this aircraft carrier. 2E14. Conclusion. The various bureaus have completed their work; the ship is ready for commissioning. She is now at the disposal of the Commander-in-Chief, U.S. Fleet, who is also Chief of Naval Operations. Through his office she will be assigned to duty, and throughout her life will receive her logistic support as a unit of the operating forces. This office initiated the request for the ship and coordinated and divided the work of the various bureaus and offices of the Navy Department. Now, several months after the first plan was drawn, the ship is ready for service in the Fleet; and henceforth her activities will be governed and her support will be supply by the office which originally sought her.